There is one artist that we researched for popular art. His name is Milind Mulick, an Indian artist, and the style of art that he draws is perspective art. Milind Mulick is a famous pop artist in India. 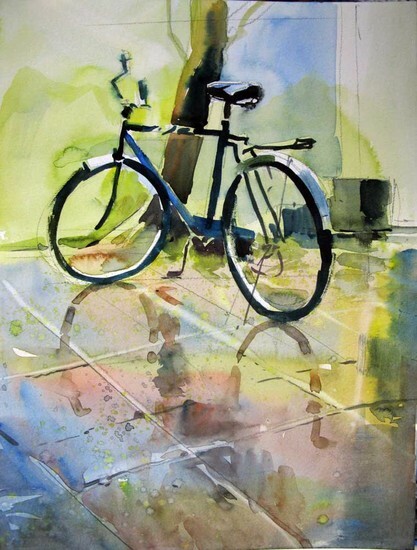 He started water color at the age of 13, and did not stop there. He went and had a formal education, but majored in engineering instead of art. Milind after graduation decided to continue painting, working on commercial and design. He currently lives in India with his family. Though he mostly engages in landscape and perspective, he also practices other forms of pop. artistic styles such as sketching, still-life, and figurative. The system of perspective is thought to have first started in ancient Greece. Before that, objects were sized by importance, known as vertical perspective. Many examples of vertical or 'Hierarchical' perspective can be viewed in the art of Ancient Egypt. In perspective painting, things are drawn to show a sense of illusion. The closer something is, the bigger it seems. The farther something is, the smaller it seems. It's this 'illusion' that artists discovered that allowed for paintings to gain a deeper level of viewing, giving a stronger sense of the painting being realistic. Artists in smaller lesser known cultures also seemed to have developed their own variations of perspective, and applied to their own folk art. Now, this style of art is one of the most popular styles in the world. The style diffused manly through Hierarchical and relocation diffusion whenever Europeans moved to North America or Asia and brought it with them. Only the 'upper class' though could afford the materials needed to paint. But, as said before, their are several origins in different areas for perspective art. Many of Milind's paintings can be based off of occurrences, locations, and objects in India, but his style is very contemporary. Madhubani art is a folk art of North India. Sunanda Sahay is a painter who practices this style of art. 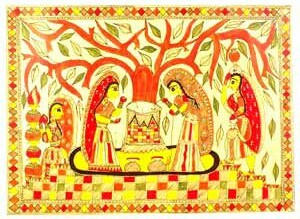 Just as many folk customs, the origin of Madhubani art is not completely known. The main idea as to where it was originated is in Bihar, India. This art style is practiced in North India, mainly around the birthplace of Sita, a leading figure in the Ramayan. This style is still painted the way it used to be painted (People still use natural colors and paint on clay walls). Although the majority stuck to the old style, some artists, such as Sunanda, paint with artificially created paint and don't necessarily paint on clay walls. This art style is mainly done by women and girls, and the technique is passed down from mother to daughter in the family. This style hasn't diffused very far, but the few places around the world that it has is due to relocation diffusion. Many people from India value culture a lot, so whenever they moved, they likely brought their practices and arts with them as well. 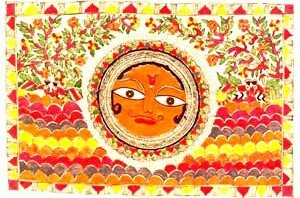 Sunanda brought Madhubani art with her when she moved from india to the USA (MA), teaching it to the local colleges. Milind Mulick is a contemporary painter who paints what he sees because of the reaction he gets from the shapes and tones of what he sees. He wishes for his paintings to give others the same reaction. Basically, he wants his paintings to look good, and he wants for others to like his paintings. 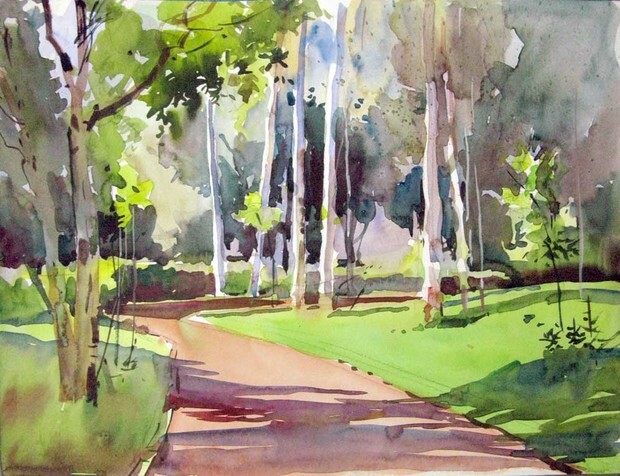 Milind paints mostly water color landscapes. 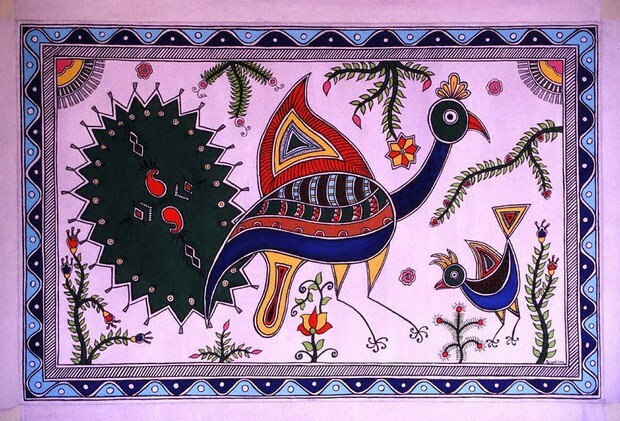 Sunanda draws different kinds of folk paintings, including the Madhubani art, preserving India's artistic culture. She doesn't really have a certain style of painting, except for folk paintings from around India. Both of the painters may have different styles, but they both have some similarities. Both of them were affected by diffusion of art styles. Neither of the artists live in the origin of the art style that they are painting. 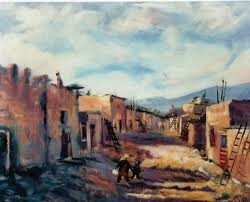 Sunanda lives in America, but uses the painting styles of different places from India. Milind lives in India while the origin of his painting style is from Europe. Both painters are also passionate about what they do and have contributed greatly to the knowledge of folk and pop culture in India. Mulick, Milind. "Milind Mulick Paintings." Milind Mulick Paintings. Milind Mulick, n.d. Web. 06 Nov. 2012. <http://milindmulick.blogspot.com/>. "Perspective (graphical)." Wikipedia. Wikimedia Foundation, 11 July 2012. Web. 05 Nov. 2012. <http://en.wikipedia.org/wiki/Perspective_(graphical)>. Sahani, Sunanda. "Colors of India." Color Of India. Sunanda Sahani, n.d. Web. 05 Nov. 2012. <http://colorofindia.com/artist.htm>. Mulick, Milind. "Milind Mulick." Milind Mulick. N.p., n.d. Web. 06 Nov. 2012. <http://www.milindmulick.com/>.